Under the Stewardship of new Resident Judge Mark Sutherland Williams, Hatton Cross Tribunal held its first user group meeting which Drystone’s Julian Norman attended. She produced the following article as a handy aide-memoir for those regularly using this busy tribunal centre who were not able to attend. 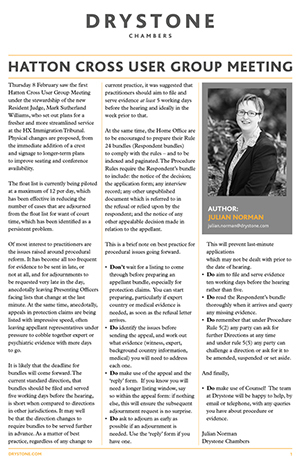 At the meeting, Judge Sutherland Williams set out plans for a more streamlined service and Julian outlines these plans, culminating with a handy ‘best practice’ section on procedure for busy practitioners.